A 2011 survey by BrightLocal, a London-based search engine marketing specialist, found that 59 percent of consumers use Google to discover new businesses, and that Google Places propels 33 percent of consumers who visit websites to contact or go to those businesses. Google Places is a free platform where you can control the information customers view, such as photos, videos and special deals and offers. You can update your details whenever you choose and even respond to comments and reviews. Another advantage of using Google Places is that you can learn how customers are finding you, such as words they are searching and more. While Google Places is free, there are a couple of prerequisites your business must meet in order to use this service. You must have a physical mailing address in order to sign up. If you are operating a brick-and-mortar retail store or other similar type of business, this is easy. If you have a mobile business or work out of your home, you must still include a physical address where you receive postal mail. You can hide your physical address once you have completed setup and specify service areas to help customers find you, so don't worry too much about listing an address. Another option is to rent a post office box to use as a business address, if you are concerned about privacy. Another requirement is that you can only create a single listing for each physical location. For example, if you operate a real estate office that also provides property management services out of the same office, you may not have two separate Google Places listings. Specify the variety of services you offer in the description and categories sections to make customers aware. 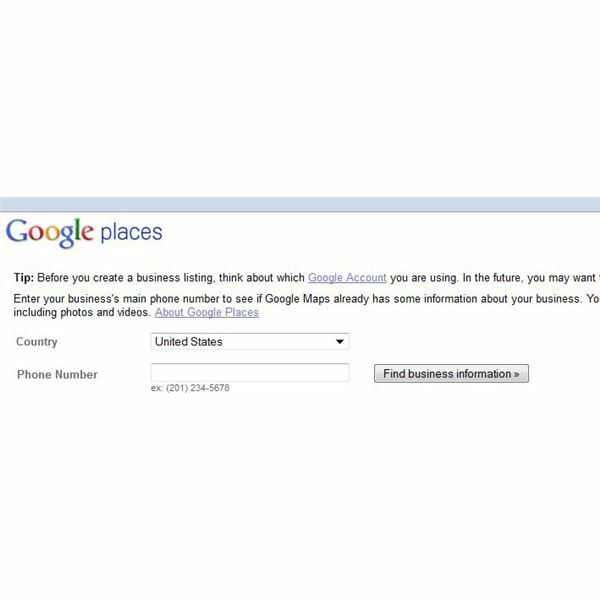 Finally, you must be the business owner or an authorized representative in order to list and verify a listing on Google Places. How Can I Add a New Listing? ion, sign up for a new Google account by clicking the Sign Up For an Account Now link. Once you are signed up and signed in, go to the Google Places for Business home page and click on Add New Business. Enter your 10-digit business phone number and click on Find Business Information to search to see if Google already has a general listing for your company. If your business is listed, click the Edit button to add your custom listing. If it is not listed, click on the Add New Business button. You will see the Basic Information form once you click Add, Edit or if there is no listing associated with your number. Fill in the form with as much information as possible. While only some of the fields are actually required, the more information you offer, the more potential customers can learn about your products or services. Complete the Service Areas and Location Settings section, noting whether your business provide services to locations in a certain area or customers come to your location. If you choose the former option, fill in details about the areas you serve. Scroll down the page and enter as much additional information as you wish, such as your hours of operations, payment options, photos and videos or custom details. When your listing is complete, click the Submit button. Choose a verification method, such as By Postcard, By Phone or By SMS, and click Finish. Once you have verified the listing, it will be available to customers, although it may take up to 24 hours for the verified listing to appear. How Should I Manage My Listing? Once you have created a listing, maintaining and updating it can help increase business. Sign into Google Places and click Edit beneath the listing to make changes to the listing. Let potential customers know about upcoming sales, post coupons and discount information that will excite them about visiting you or upload pictures and videos from recent events. When you log into Google Places you will see your dashboard, which offers information on your listing status as well as statistics about your account. With these statistics, you can learn how often your listing has appeared in search results as well as how many people have actually clicked through to your listing after it appears in their search results. In addition, you can find out what search terms people are using to find your business, locations from which they are searching or seeking driving directions and more. This data can help you provide the best information and help you get noticed.